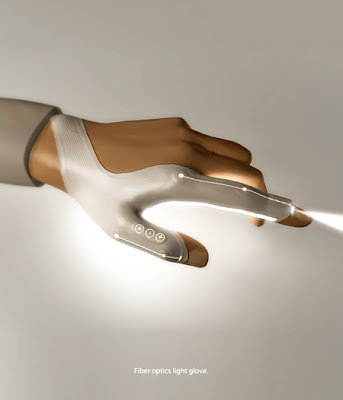 LED is a personal lighting device designed by Tilen Sepic with a new conceptual torch light that will make you feel like you are Cyclops from the X-Men. LED lighting requires little energy and produces little heat. 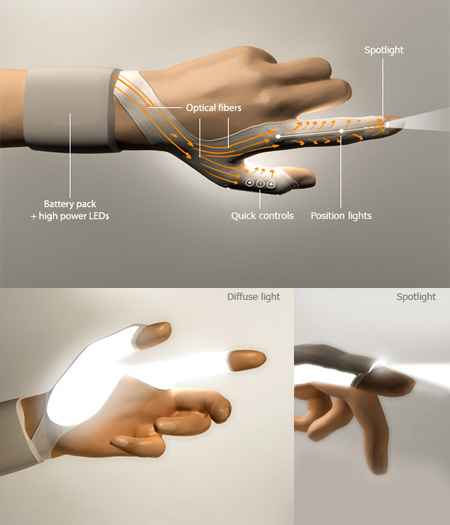 It is realistic to package into a glove-like device. The bright, clear and shadow less light is idyllic for hands-free task lighting, produce a working light without the hassle of shadows being reflected in the object. Multi-task glove with LED lights. LED light can be positioned in one of four directions. Useful to see in confined dark spaces. Enhanced battery backup and generally provide up to 14 hours of use. The light being transferred through the attached optical fibers to a specified location. Makes crazy tracing patterns with your hands in the dark. Smooth surface inside – no wires.